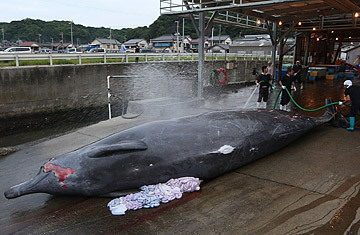 Japanese Fishermen hose down a Baird's Beaked whale at Wada Port in Minami Boso, Chiba, Japan. On Dec. 7, 2009, the Steve Irwin, a ship belonging to the radical anti-whaling Sea Shepherd Conservation Society departed from the port of Fremantle, in Western Australia, bound for Antarctica. It was farewelled by members of the celebrated animal conservationist's family, who supported the Sea Shepherd's Mission to obstruct the Japanese whalers in Antarctic Waters. The Steve Irwin was later joined by two more vessels from the Sea Shepherd's fleet: The high-tech stealth boat Ady Gil, which sunk in the Southern Sea following a collision with whaling boat on Jan. 6., and the Bob Barker, a ship that survived a collision on Feb. 6 and is currently exchanging rancid-butter bombs with water canon fire from the whalers. On Feb. 15, New Zealander Pete Bethune, the former captain of the Ady Gil crew, boarded Japan's Shonan Maru 2 in the middle of the night, presented the skipper with a $3 million invoice for sinking the Ady Gil, and attempted a citizen's arrest. Bethune was detained by the crew of the Japanese vessel, and according to Paul Watson the President of the Sea Shepherd Conservation Society the ship has turned back to Japan. Bethune could be facing trespass charges in Tokyo. "It's one more whaling ship out of the water," said Watson, who is onboard the Steve Irwin. "Our presence has cost them $70 to $80 million dollars." News in Australia this summer has been punctuated by the Sea Shepherd's activism in Antarctic waters. Despite the fact that they may have committed piracy by boarding another vessel in the high seas and demanding money from the captain, public sentiment is on the activists' side. In a national poll conducted in January, 94% of Australians said they were against whaling. The Australian Greens Party will welcome the Sea Shepherd fleet when they return, and on Feb. 19, Prime Minister Kevin Rudd gave Japan an ultimatum: Stop whaling by November, or the Australian government will take Japan to the International Court of Justice. Australia has long been a strong opponent of whaling. During the conservative John Howard administration, the federal environmental minister lobbied for the International Whaling Committee (IWC) to ban whaling altogether in 2005. Two years later, a promise to put pressure on Japan to stop culling whales was part of Rudd's own election campaign platform, though last week's announcement was the first major step his administration has taken on the issue. "The Australian government promised to do something two years ago. They have been stalling on the issue," says Wally Franklin of the Southern Cross University Whale Research Centre in Lismore, in New South Wales. "Whales are being killed unnecessarily, and illegally. Australia has a case, but it looks like the missing ingredient is political will." In 1986, the IWC implemented a worldwide moratorium on the killing of whales for commercial purposes. It was a move that helped several depleted whale species rebound, but few countries, including Japan, have continued to hunt whales using a loophole in the moratorium that permits whaling for research purposes. Today, Japan hunts hundreds of whales each year under its scientific program, the meat of which continues to be sold on the domestic market. "Most people have long come to the conclusion that no worthwhile research is coming out of this," says Franklin. Calling Japan out on its whaling program could put Australia in a sticky position; Japan is, after all, Australia's largest export market. After Rudd's announcement last week, Japan's Foreign Minister Katsuya Okada and his Australian counterpart Stephen Smith held a pre-scheduled meeting in Perth. "We were able to confirm that the Australia-Japan relationship has gone beyond that of economic complementarity and is now a strategic partnership," Okada told reporters after the meeting. "Should court action become a reality, then Japan will seek to represent its case to the IWC, supporting the fact that its activities are legal and within the convention." Rudd's move may have more to do with his flagging approval ratings than his passion for wildlife conservation. "Both countries have similar views on climate change, deforestation in South East Asia, and nuclear disarmament," says David Walton, senior lecturer in Asian studies and International Relations at the school of Humanities and Languages at the University of Western Sydney. "The [whaling] issue has been bubbling to the surface for some time. It was a big part of Rudd's election campaign. I think there is a domestic element to Rudd's rhetoric." Australia is due for an election at the end of this year and Rudd's approval rating has slumped from 65% in November to 55% in February. This could be due to the rising popularity of Tony Abbott, the leader of the opposition since December. Stopping whaling to the country's south has so far sat on a list of unfulfilled election promises with issues such as health care and housing. "I challenge the prime minister either to take Japan to the International Court or to admit that that was always just an empty gesture," Abbott told a government meeting in January. In the meantime, for many in Australia, even if Japan does end its whaling program in November (which history would suggest that it won't) that's still too long to wait for any decisive action. "Australia should seek an injunction to stop current whaling while the International Court of Justice determines the matter," Bob Brown, the leader of the Australian Greens Party, said in a statement. Watson, who was named by The Guardian in 2008 as one of 50 people that could save the planet, agrees. "It's as if the Australian government has told a bunch of bank robbers, 'Look you can continue robbing banks until November, but afterward you will have to stop,'" he said. "Japan is doing something cruel and illegal. They have to be stopped."